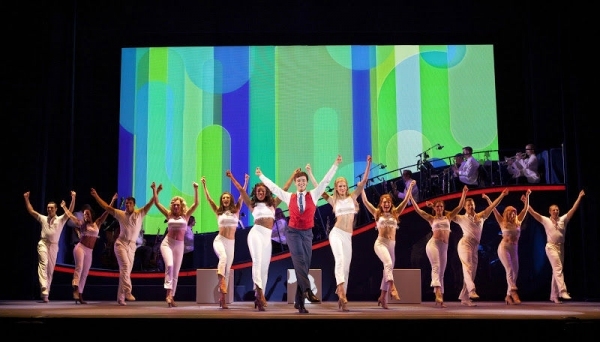 If you've read this blog before, you know that I'm not a huge fan of movies made into musicals, preferring instead to see original and creative work written for the stage. 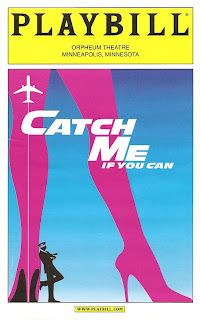 But I was curious about Catch Me If You Can*, based on the 2002 Spielberg movie, which was in turned based on Frank Abagnale Jr.'s 1980 auto-biography about his life as a highly successful teenage con artist in the 1960s. It's a fascinating story in any format - how this young and incredibly intelligent man was able to impersonate a pilot, a doctor, a lawyer, and presumably anyone he wanted to be. Lucky for us he now uses his powers for good, not evil; after spending time in US and European prisons, he's worked for the FBI for 36 years, helping to prevent the crimes he perfected. It's no wonder someone wanted to turn this story into a musical. I found it to be, while not the perfect musical, genuinely enjoyable and entertaining. With few exceptions the songs are fast and catchy and fun, the choreography and dancing is of the high standards of Broadway, and the set and costumes transport the audience back to the 60s, as seen through the bright and happy TV shows of the era (more Laugh-In than Mad Men, and especially bringing to mind the underrated and over-before-its-time Pan Am). All in all a successful adaptation of a movie that did not seem to be crying out to be made into a musical. But with successful musical theater creators Terrence McNally (book), Marc Shaiman (Music and Lyrics), and Scott Wittman (Lyrics), it works. Act fast if you're interested - it's playing at the Orpheum Theatre through this weekend only. A trio of great voices belonging to charismatic actors lead the show. Dominic Fortuna (who seems to have wandered over from Jersey Boys) is sympathetic as Frank's down on his luck dad, whose schemes are never quite as successful as his son's. Merrit David Janes is FBI Agent Hanratty, who's trying to catch Frank, and eventually does. It's a role that won Norbert Leo Butz a Tony last year, and Merrit gives it the energy and humor required. Last but not least, Stephen Anthony is the star of the show as our charming hero/antihero. He's got a great voice and inhabits all of Frank's various guises with ease, while still letting us see the lost and searching boy underneath. The obligatory romance is one of the least successful subplots; the real relationship driving the show is between Frank and Hanratty. Though they only share a few scenes together, theirs is the most interesting relationship and most compelling chemistry. The ensemble is fantastic in their 60s wardrobe; they look, move, and sound great. The show is set up as Frank telling his story on a 60s variety show, complete with colorful graphics displayed on the backdrop of the stage, and an awesome band onstage, dressed in white tuxes. The score is energetic and fun; highlights include "Don't Break the Rules" (Hanratty's shining moment), Frank's emotional "Good-Bye," and the final duet between Frank and Hanratty - "Strange But True," which pretty much sums up the plot. On the night I attended, "the real Frank Abagnale Jr." was there for a Q&A after the show. He just happened to be in town speaking to US Bank about fraud prevention, and popped into the theater to talk to the audience. It was obvious from his answers that he's been talking about this for a long time and has been asked everything multiple times. But it was fascinating to hear more details about his story from the man who lived it, and find out what is real and what is Hollywoodized or Broadwayized. As for the musical version of his story, he said, "I kind of even like it more than the movie." I think I kind of agree. 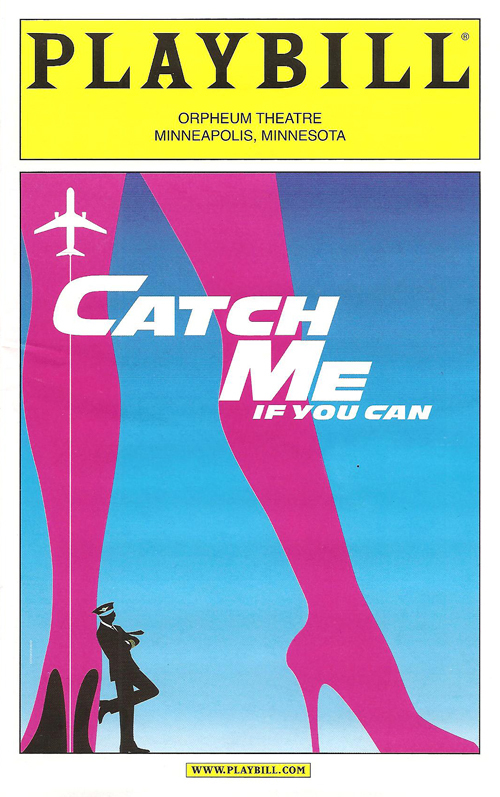 *I received one complementary ticket to Opening Night of Catch Me If You Can.